The wise win before they fight, while the ignorant fight to win. So wrote Zhuge Liang, the great Chinese military strategist. He was referring to battlefield tactics, but the same can be said about any strategic situation. Even seemingly certain defeat can be turned into victory whether in battle, business, or life by those with the strategic vision to recognize how to change the game to their own advantage. The aim of David McAdams s Game-Changer is nothing less than to empower you with this wisdom not just to win in every strategic situation (or game ) you face but to change those games and the ecosystems in which they reside to transform your life and our lives together for the better. Game-Changer develops six basic ways to change games commitment, regulation, cartelization, retaliation, trust, and relationships enlivened by countless colorful characters and unforgettable examples from the worlds of business, medicine, finance, military history, crime, sports, and more. The book then digs into several real-world strategic challenges, such as how to keep prices low on the Internet, how to restore the public s lost trust in for-charity telemarketers, and even how to save mankind from looming and seemingly unstoppable drug-resistant disease. In each case, McAdams uses the game-theory approach developed in the book to identify the strategic crux of the problem and then leverages that game-awareness to brainstorm ways to change the game to solve or at least mitigate the underlying problem. So get ready for a fascinating journey. You ll emerge a deeper strategic thinker, poised to change and win all the games you play. In doing so, you can also make the world a better place. Just one Game-Changer [is] enough to seed and transform an entire organization into a more productive, happier, and altogether better place, McAdams writes. Just imagine what we can do together." Real-life lessons presented in a readily accessible way for the benefit of non-business readers." 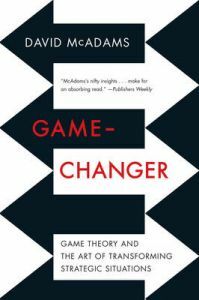 "David McAdams's Game-Changer is a rare book: a nontechnical first introduction to game theory that also offers a fresh perspective, on how the best strategy for playing a game can often be to change the rules. I can see that I'll have lots of opportunities to recommend it." -- Alvin E. Roth, winner of the 2012 Nobel Prize in Economics "Ideally, business strategy books provide both general insights applicable to a broad set of competitive situations and illustrations of the theory that demonstrate the richness of the insight and the practical formulation of strategy. Game-Changer is chock-full of both insight and applications." -- R. Preston McAfee, author of Competitive Solutions: A Strategist's Toolkit "Intriguing... An absorbing read.